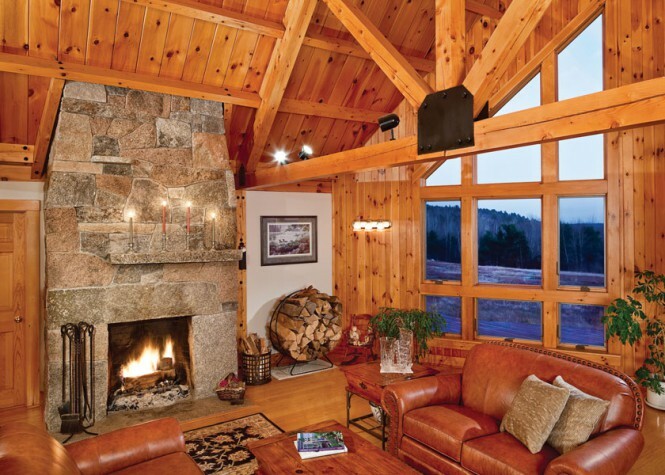 When it comes to heating a room, fireplaces aren’t always the most efficient option, but then there’s not much romance to snuggling under a blanket by the wood stove, even less in sipping wine around the monitor heater. 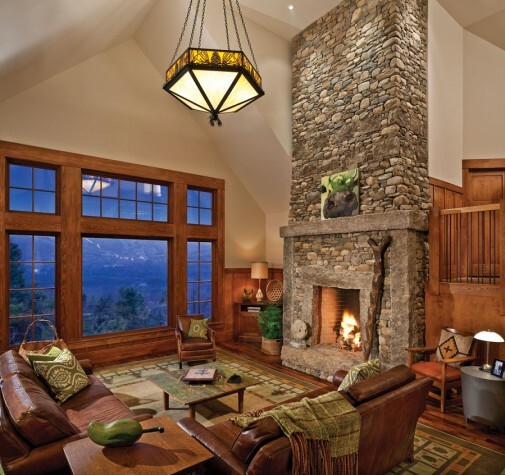 Fireplaces offer charm, sometimes drama, certainly associations of comfort. Warm your hands around a mug of hot chocolate, toast your toes in front of the fireplace…this is the reward for a driveway well shoveled. 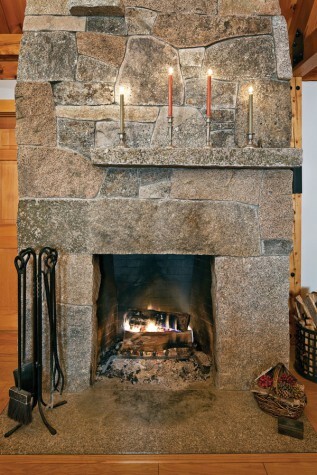 Today, some Maine builders and designers are complicating our sense of what is beautiful, and even practical, by finding surprising new ways of constructing the home’s hearth. One day, a little over three years ago, Fairfield was at a gas station when he struck up a conversation with a man who mentioned that Italian immigrants had once quarried his Arundel property. The quarries, the man said, had been abandoned for a hundred years. He then offered Fairfield the stone if he was interested. 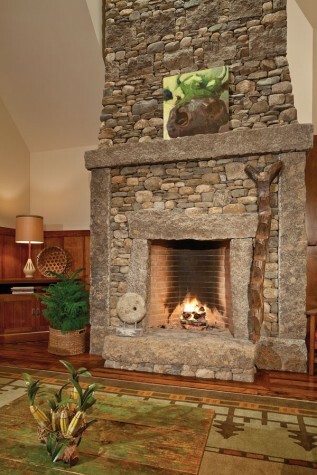 “I was in awe,” Fairfield says of the hand-split granite, but it wasn’t until two years later, when the Trudos approached Fairfield about working on his fireplace, that Fairfield had the opportunity to use the stone. 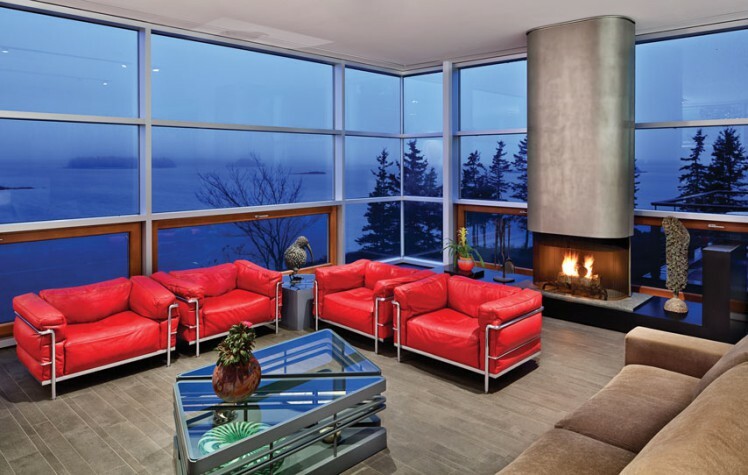 e Hill’s Elliott Elliott Norelius Architecture—designed a fireplace hidden inside a brushed stainless-steel tube. When in the up position, the stainless-steel tube hangs from the ceiling above a hearth of cast polished concrete with a soapstone insert. When in the down position, an enclosure drops from the tube to settle on the hearth and form the fireplace. 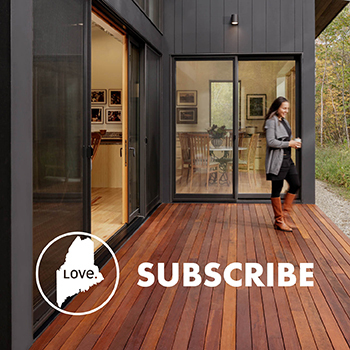 The fireplace for this home on Little Deer Isle consists of a stainless-steel tube that hides a fireplace. “The strange thing about this fireplace,” says project designer Matt O’Malia, “is that it hangs from the ceiling.” A grab bar at the back of the tube allows the fireplace element to be lowered onto the hearth. The same bar is used to open the damper. The back portion of the fireplace is made of solid steel to prevent the sort of excessive heat transfer that would ordinarily cause the windows behind the fireplace to crack. The front portion has a screen that opens in the middle and can be brushed to the side when adding logs. A complex series of pulleys inside the tube makes it easier to move the fireplace element up and down manually. Portland structural engineers devised a way to safely attach the fireplace to the steel-framed house. Brewer-based metal fabricators were responsible for the actual construction of the fireplace and its stainless-steel casing.